Although they were devised as a low price positioning choice for consumers concerned by food products prices, recently most private labels have developed a specific differential positioning, some of them priming quality, some priming other non-price related factors. A few of these factors can be best related to certain brands. However, the majority of the Spanish food brands still have some shared attributes which, when concurring, can be used as predictors of PL purchasing. Based on the research data from a survey, the authors reconstruct what happened with PL from the years before the recession to the present time. 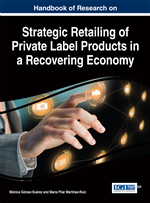 The influence of the crisis on the private label positioning is also examined. There is a considerable volume of academic literature focusing on perceptions when undertaking the study of Private Labels. It is widely accepted that the value of a brand transcends the value of the products that it covers and identifies (Shocker & Srinivasan, 1979), and that using products recreates feelings and emotions in the consumers’ mind, becoming a means of self-expression and for creating self-identity (Aaker & Mc.Loughlin, 2007; Richins, 1994). Marketing actions taken on price, price promotion, store image or advertising may alter the consumers’ brand value (Yoo et al., 2000). As with any other brand, all PL are increasingly imbued with emotion and ‘imagery’, more than just the functional logic attached to PL in the previous generation (Kumar et al., 2007). Attributes to explain consumer proneness to purchasing PL are often considered in the academic literature from the perception point of view (Ailawadi & Keller, 2004; Wicks & Roethlein, 2009; Zeithaml, 1988). Even risk analysis has been approached from the consumers’ perception of the risks themselves and the alimentary safety (Verbeke, 2005).